Who knew? 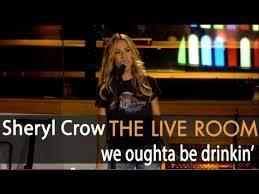 Sheryl Crow likes to drink! She sings about it. Watch Crow’s newest video for ‘We Ought to Be Drinking’ (we couldn’t agree more, Sheryl). While Neil Diamond’s “Sweet Caroline,” Garth Brooks’ “Friends in Low Places,” and Willie Nelson’s “Whiskey River” are classics, we’re in desperate need of a new drinking song . And no, Robin Thicke’s “Blurred Lines” doesn’t count. Crow admits that she doesn’t make cocktails much at home, but she does always have Don Julio Tequila and Tito’s Vodka in her personal liquor cabinet, and she enjoys Pomegranate Martinis and the frozen Watermelon Margaritas featured in her cookbook, If It Makes You Healthy.